My grandfather’s family crossed the Irish Sea and emigrated to Cornwall during the early days of the Great Potato Famine that started in 1845 and lasted at least four years. They gave up the uncertainty of farming life for the dark drudge of tin and copper mining. But the potato remained a staple in the diet, being an equal part ingredient in the Cornish Pasty along with the meat and vegetable. Cornwall was always a comparatively poor county. The main industries being tin mining, china clay mining, fishing and farming. The men folk for the most part needed a lunch that would pack well, withstand rough treatment, and be nutrious and sustaining. The Cornish Pasty met all these criteria. Traditionally a miner’s midday meal, grandad would tell how the pasty’s dense folded pastry could stay warm for as long as eight hours and that when stored close to their body, the hot pies would help to keep the miners warm too. He also claimed that the best pasties had two course fillings – one end being filled with the meat mixture, the other with jams or fruits such as plums or apples. 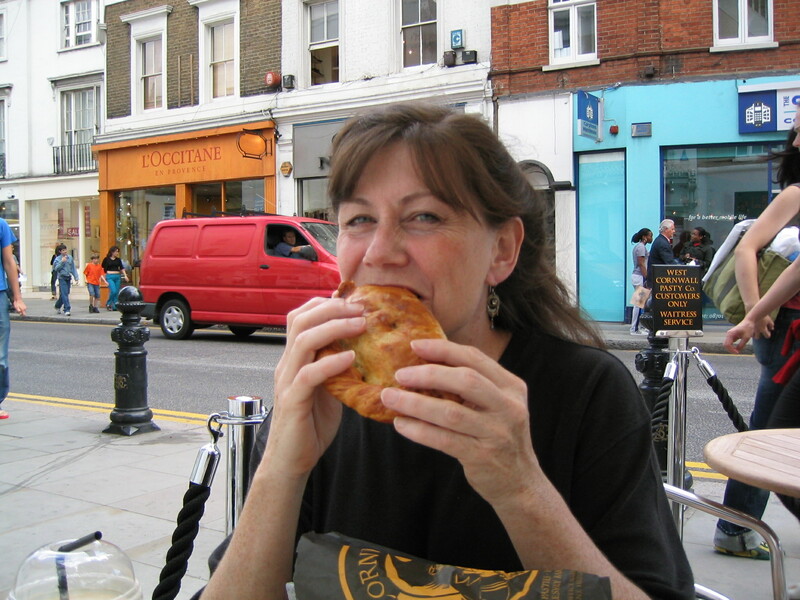 There are no completely standard pasty ingredients, although the traditional recipe would include diced meat, sliced onions and diced potatoes. Today’s selections have expanded becoming more ingenious and flamboyant to include cheeses, curries, chicken and ham and even turkey with stuffing. Whilst meat is a common ingredient in modern pasty recipes it’s doubtful that it was much in evidence in the pies of the 19th century Cornish miners, it was more likely a pastry pocket for left overs. The Cornish are known for their superstitions, believing in luck (both kinds), pixies, fairies and the little people. 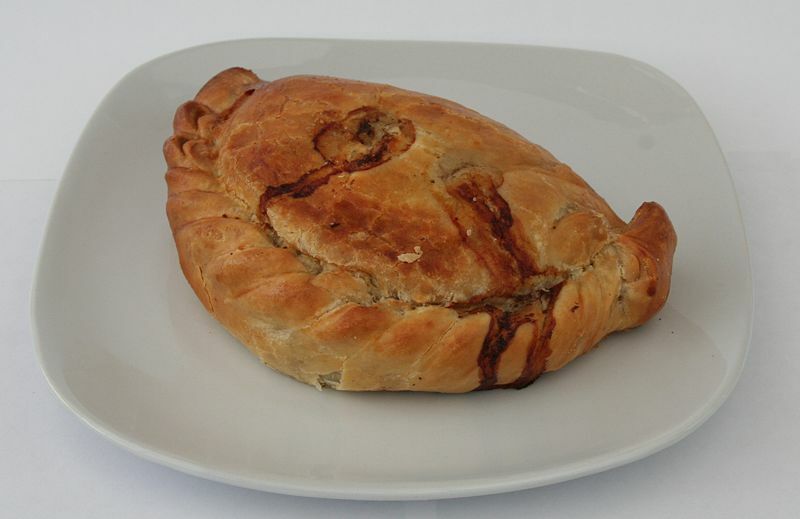 It’s an old wives’ tale that the devil knew the habit Cornishwomen had for putting any available food into pasties, and so he would never dare to cross the River Tamar (Devon) into Cornwall for fear of ending up as a pasty filling! the rich dense pastry is the secret to success, be sure that you don’t roll it out too thinly, the “crimped” edges are typical of this pie, and the juices oozing out are a mouthwatering bonus. Rub the fat into the flour but not too finely. Add the salt and gradually start adding the water until it works together into a ball without being sticky. Put aside in a cool place. Dust the work surface with flour. Roll out the pastry to about 1/4 inch thickness. Using a small plate, cut out circles. Moisten the edge with milk or water and support half of the pastry nearest to you over the rolling pin. On the other half, put a small layer of prepared vegetables then a layer of beef. Repeat this once but be careful not to have too much filling which would cause the pastry to burst during the cooking process. Sprinkle sparingly with salt and pepper then add a small bit of the butter. Sprinkle a dusting of flour over the filling as this helps to make the gravy. Fold the other half of the pastry that has been resting on the rolling pin over the filling and squeeze the half circle edges firmly together. Starting at the right side whilst supporting the left side with your other hand, using the first finger and thumb turn the edge over to form a “crimp”. Repeat this process all along the edge. This will come with practice, but be sure to get a good seal. Brush the pastry with beaten egg wash to help with the browning. Put one inch cut or snip in the centre of the top to allow steam to escape. Bake for 10 minutes at 425F then reduce the temperature to 350F and bake for a further 40 minutes. I ate these when I was in Scotland many years ago and they were delicious. This is the first recipe I’ve seen for them. Thanks!